The Transformers BotBots are divided into eight teams, based on what store in the mall they hail from. For instance, there are two bathroom supply stores, both bringing us the members of the Toilet Troop; the one upstairs on Level 3 is the home to Stinkosaurus Rex. Stinky is a potted plant, which you'd think would make him more of a fit for the Shed Heads, but nope: Toilet Troop he is. Do some people actually keep plants in their bathrooms? I don't, and I've never been to the house of anyone who does, so it just seems weird. If you do, share your secret shame down in the comments. The design is fairly straightforward: a squarish brown pot with some pebbles, some short grass, and a few tall, leafy fronds. It does seem kind of odd that there's such a progression of heights - bare, then short, then tall - but hey, what do I know? Maybe that's the way these imaginary toilet-plants always work? 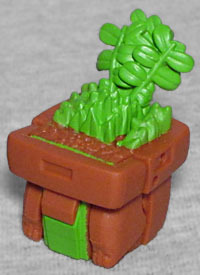 BotBots are meant to be easy to transform, so all you have to do here is lift the front edge of the pot, push the leaves down to the back, and then pose the arms however you want. That's all! Stinkosaurus Rex takes his job as a bathroom lookout very seriously, even if it makes him smelly. Since he sits on the toilet, his leaves soak up a lot of stink. He scopes out potential threats and roars when he sees trouble. 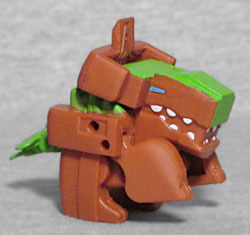 As you may have guessed by the name, Stinkosaurus Rex's robot mode is a tiny little dinosaur. 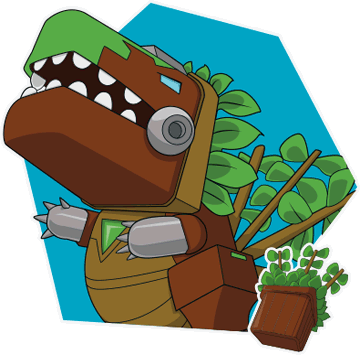 The official art makes him look kind of like the hero of Super Dino Boys, but the real toy is even blockier than that. The face, hind legs, and the tail work pretty well, but the arms are so big that they undermine the T. rex look, and the kibble around the head is hard to ignore. Stinkosaurus Rex has a cute design, but the toy doesn't quite live up to it. This entry was posted in blog exclusive review, Hasbro and tagged dinosaurs, Transformers. Bookmark the permalink.